$650.00 Some options in stock. Order in the next 13 hours, 29 minutes and it will go out today! Some options in stock. Order in the next 13 hours, 29 minutes and it will go out today! The Opus Book Test introduces a brand new method for book tests. It allows for a completely hands off presentation, no fishing and no forcing. 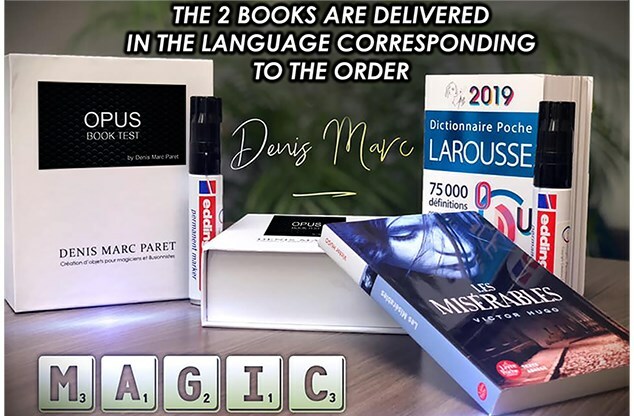 Denis Marc Paret has created an ingenious way of divining which word the spectator is thinking of. It uses an “Intelligent Marker”. With this incredible piece of technology, you will be able to perform miracles. You offer the spectator a choice of two books. A dictionary with over 1000 pages and a well known novel with approximately 300 pages. They name a page number and turn to that page. With no fishing you can immediately reveal the first word on the page. You can even divine other words on the page which can be buried deep in the text. They can even go to the page before and the page after - you can tell them the same information on those pages too! They can even check the same page in the other book if they want - you can still tell them the word they are thinking of! There are two main risks involved performing a book test. 1) The spectator may end up on a blank page. 2) The spectator tells you a page number that is not in the book. With the “Intelligent Marker” method, you'll know this ahead of time so there is no risk of you being caught out. What is an “Intelligent Marker”? The marker has a digital device built into it which secretly transmits the information to you. It can be operated in one hand and the page number can be easily changed. The secret device is concealed inside a genuine marker so it can be used in any environment - even close-up! It is a functioning marker that you can refill. The best bit? It's fully guaranteed. If it breaks, we’ll supply you with another. Mark asks: What is the font size, will I be able to see it? Steve asks: Does it only work in French? (Just kidding.) Must the performer wear dark glasses? (Not kidding). Jeff asks: No demo of a real performance ? Duh ! 1. James answers: Does any video really show an actual performance? Never. Every demo, for every effect, from every magic shop never, ever shows an actual unedited performance. the "fake" performances are ALWAYS edited and shopped up so you never see what really needs to be done to actually perform the effect in real life. This is nothing out of the ordinary. You would think for $650, it would be different. But it is not. Also, from the small photo, the dictionary doesn't look like any dictionary with which I'm familiar. 1. Denis answers: the stuff is sold with books in the language you choose. They are different depending on the language. but they are normal books. a dictionary and a novel. There is no simile with "zodiac". you can also change the books by contacting the author after your purchase but there will be a small job to do from you. Bryan asks: The preview video shows nothing at all. We have no idea of what happened. 1. Denis answers: we can not show it, but it's explained "in the text The viewer chooses a book, opens the book and chooses a page You immediately know the words of the pages You do not touch the book and you can to be more than 30 meters from the viewer.The viewer can change pages or books, you always know the answer.It is as if you had the book in hand, but you have nothing, only the marker. Pynchas asks: What happens when the marker runs out of ink or dries up? 1. Denis answers: The marker is refilled with the ink. In addition the ink is supplied with. Edward asks: Can performers who are left handed read the marker conveniently? 1. Denis answers: Yes, there is no problem. 2. Vanishing Inc. Magic responds: To clarify Denis' answer: you must change hands before writing the prediction to read the word. Claes asks: Quite poor demo video, i´m still confused over what it is ? A book test,yes, but a live performance had helped me i think. 1. Denis answers: The viewer will choose a book. You ask him to open this book on any page and give you the page number. IT IS VERY IMPORTANT TO UNDERSTAND THAT THE SPECTATOR CAN BE MORE THAN 30 METERS FROM YOU AND THAT YOU NEVER HAVE THE BOOK BETWEEN HANDS. - The marker will immediately indicate the first word of the page. - You also announce a line number. This line number is indicated by the marker which also gives you the first word or words of this line. The lines are all different, they have been inserted randomly. - You can announce the same things immediately on the next page. - You can go from page to page until the end of the book if you wish. At any moment, the viewer can decide to change books. To return to the first with other pages. You only press a button. - Every time you will know what to answer. - If he wants to trap you by giving you a non-existent number, you'll know it - If he wants to trap you by giving you an empty page number, you'll know it. The use is only one hand, simply with the thumb. - Ignition of the marker. A light will come on to inform you that the marker is on. - The choice of book 1: a red led will light - By simply pressing a button, the choice of the book changes and the blue light comes on. - You can skip pages simply with a button to go from 127 to 128 for example. When you are on a page, you can request a number between 1 and 10, suppose 9. The viewer advances 9 pages and you immediately get the same information. In short, you can do everything. 2. dean answers: Please show a proper demo of the product from start to finish,i adore book tests but that's a lot of money to buy a blind date, so come on if you want to sell prove the products strengths and weakness thanks Dean. Koen asks: Does it work (or is it available) in Dutch? 1. Vanishing Inc. Magic responds: It is currently only available in English, German, Spanish and French. Steven asks: While it has a guarantee, how long is it expected to last. MICHAEL P asks: Is the readout limited to just the 1st word on page and 1st word on random lines? Does it give any other data about the page? 1. Vanishing Inc. Magic responds: You can read out multiple words on the page (some in the middle of the page). You can also do the same on the adjacent pages! Eli asks: How much are replacement books? How much to costomize to a book/books we choose? 1. Vanishing Inc. Magic responds: This information can be obtained direct from the creator. 1. Vanishing Inc. Magic responds: You must use the books supplied. 1. Vanishing Inc. Magic responds: That's the secret! Robert asks: The description of the Intelligent Marker refers to a USB chargeable European plug socket. How does this affect the use of the Intelligent Marker here in the United States? Thanks. 1. Vanishing Inc. Magic responds: You can charge it with USB. No concerns there, American friend. Robert asks: Is it possible when ordered to request English dictionary and French novel? Or one in one language and the other in a different language that is available? Thanks. 1. Vanishing Inc. Magic responds: I am afraid it is not possible.